Sleeping comfortably is so incredibly important to your overall health and well-being. The last time I can remember sleeping comfortably was in May of 2016. When we rented a condo in Hawaii for five months last year, we slept on a very thin, old, cheap coil mattress. When we moved here to Kansas, we had to fill an entire apartment with necessary furniture so we purchased an affordable memory foam mattress that turned out to be a disappointing purchase. It left us waking up constantly throughout the night, tossing and turning with our backs and hips hurting, and in general sacrificing any good sleep. The opportunity to review the REM-Fit Sleep 500 12-Inch Hybrid Memory Foam and Pocket Coil Cooling Mattress was an answer to many prayers! My REM-Fit Sleep 500 Mattress arrived at my front in a tall box. It was a bit heavy, but it easy enough for me to remove it from the box and move it from one room to another by myself. The mattress comes compressed, wrapped in plastic horizontally, and slipped into another plastic covering. It also comes with a tiny backpack that contains the paperwork, instructions for easy setup, and a tool for opening the packaging without damaging the mattress. The REM-Fit mattress instructions are entitled Ready, Set, Sleep and include five simple steps...arrival, place mattress in room, use mattress opener, unwrap for mattress recovery, then sleep. The mattress also comes with a small booklet called the Rest and Recovery Book, filled with tips on getting a good night's sleep. There is also a coupon enclosed for discounts on their other products, such as the ZEEQ Smart Pillow, Sleep 400 2-Inch Memory Foam Mattress Topper, Energize Collection 400 Series Mattress Protectors and Pillow Covers, and the 400K Series Bedding Protection Kit. 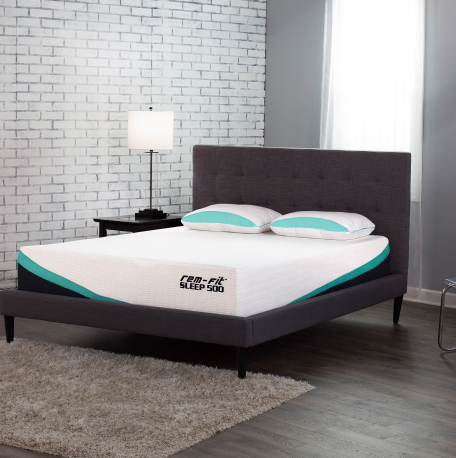 The REM-Fit Sleep 500 Mattress is a combination of memory foam and pocket coil. It has five layers of memory foam for cool comfort, pressure relief, and motion separation, plus a layer of 6-inch pocketed coils for responsive support. It's topped with premium fabric, and the cooling memory foam optimizes airflow, wicking moisture away from the body, and features Nordic Chill fiber which disperses heat throughout the night for cooler, more sound sleep. It's made of hypoallergenic materials, naturally inhibits bacteria, and comes is backed by a 10-year warranty. The REM-Fit Sleep 500 mattress begins to slowly expand as soon as the outer plastic is removed. Before removing the inner plastic, we maneuvered the mattress into place on the box springs. We opened the plastic from the bottom and removed it easily. It only takes a few minutes for the initial mattress recovery and expansion to be complete, but I think it would be best to let it recover for at least an hour before you actually sleep on it, just to make sure it's fully recovered from it's journey to your home. As we unwrapped it, we discovered that the bottom of the REM-Fit mattress has tiny little grip dots to keep it from sliding around on the box spring, which I absolutely love. It also features a zipper so that it can be removed for cleaning, another fabulous feature in my opinion. Right away, I could tell that the mattress was taller than the one it's replacing. For the past year and a half, my sleep patterns have been horrible. It takes forever for me to fall asleep and I wake up several times throughout the night. When I get up in the mornings, my hips and my back hurt. I am tired all the time from restless sleep, even though I sleep seven hours. My husband and I are both "hot" sleepers and he normally only sleeps about five or six hours a night. When we get up at night, we wake each other up. We were anxious to try out the REM-Fit mattress. We have now slept on the REM-Fit Sleep 500 for three nights. It is absolutely wonderful. Sleep comes almost immediately and we are both sleeping soundly all night long. There is no waking, no tossing, no sweating, and no pain. When I lay down on the mattress, my body sinks down just enough that every part of my body is supported. I have tried laying down on my back, my side, and my stomach, and no matter how I lay down, my entire body is fully supported and cradled. I haven't slept on my stomach in years, even though it's my favorite sleeping position, but now I can. We are both sleeping much better and waking up more rested. I haven't heard my husband snore in three nights. The first night, he came to bed after I was already asleep and he said I was so silent that he had to check and make sure I was still alive. I am incredibly impressed with the REM-Fit Sleep 500 mattress and I highly recommend it. I can't wait to try out some of their other products. Read more about the REM-Fit Sleep 500 Mattress at rem-fit.com. They have a huge line of products that would make excellent gift ideas for the upcoming holidays!